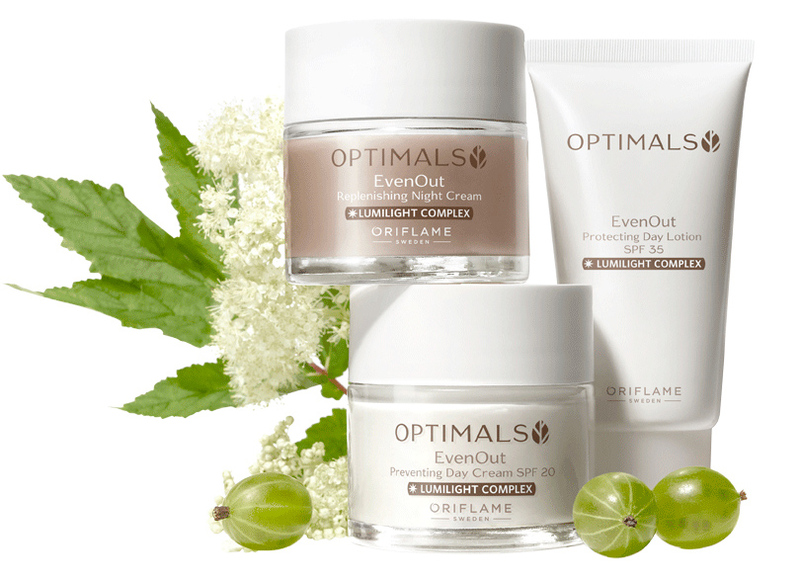 Oriflame offers the line’s Even Out Optimals – with combinations of Swedish natural ingredients that help prevent dark spots and to maintain a young and beautiful skin. Enhanced by nature and optimized by Oriflame scientists, Even Out effective formulas combined with Swedish natural ingredients and LumiLight Complex reduce the appearance of dark spots. The complexion becomes more uniform, radiant and perfect. What makes Even Out a single line? All Even Out products contain a combination of Swedish natural ingredients. Together, they reduce the appearance of dark spots and reveal a more uniform and radiant complexion. Melanin is the pigment responsible for producing color in the skin. When it is irregularly distributed, discolorations may occur, such as age spots and sun spots. The LumiLight Complex acts to minimize the appearance of existing dark spots and prevent the formation of future discolorations. Specially selected plants with multiple benefits are used in Even Out formulas. Together, they work to reduce the appearance of dark spots, helping to achieve a naturally radiant and perfectly uniform complexion. 8 out of 10 women agree that it standardizes the skin tone *. * Opinion of women who performed the consumer tests with Day Cream, Night Cream and Serum Even Out Optimals. Optimals Moisturizing lotion with a light texture, which reduces the appearance of dark spots and hyper pigmentation, helping to reveal a naturally radiant and uniform skin. FPS 35 protects the skin from sun damage and premature aging. Contains a combination of Swedish natural ingredients, LumiLight Complex and Active Antioxidant. Dermatologically tested. Suitable for all skin types. 50 ml. Filipendula ulmaria – with Vitamin C, which effectively reduces dark spots. Reduces the appearance of dark spots. Contains Blurring Pearls, light diffusers, to reveal a smoother and radiant complexion. Concentrated, instantly moisturizing facial serum that reduces the appearance of dark spots and contains light-diffusing Blurring Pearls to reveal a smoother, radiant complexion. Formulated with a combination of Swedish natural ingredients and LumiLight Complex. Dermatologically tested. Suitable for all skin types. 30 ml. A rich and nourishing evening cream that reduces the appearance of dark spots, helps prevent their formation and promotes a more even complexion. Formulated with a combination of Swedish natural ingredients and LumiLight Complex. Dermatologically tested. Suitable for all skin types. 50 ml. Vitamin C helps to effectively reduce dark spots. A moisturizing day cream that reveals a naturally radiant and uniform skin. It effectively reduces the appearance of dark spots and helps reduce hyperpigmentation. Contains SPF 20 to protect skin from sun damage and premature aging. Formulated with a combination of Swedish natural ingredients, LumiLight Complex and Active Antioxidant. Dermatologically tested. Suitable for all skin types. 50 ml. Filipendula ulmaria – with Vitamin C, which effectively reduces dark spots .. Cleaning Foam Cleanses gently and helps reduce dark spots – revealing a uniform, luminous and radiant complexion. Helps reduce dark spots and promotes a uniform, luminous and radiant complexion . Removes traces of impurities, tones the skin and pores. Reduces the appearance of dark spots and dark circles around the eyes. Illuminates instantly and promotes a uniform complexion. Apply a Wet Face Cleaning morning and evening. Massage and rinse. Apply the tonic on a cotton disc and rub on the face. Apply the eye cream, applying with light touches in the orbital zone. Apply the serum to the face. Apply Day Cream or Day Lotion every morning, and Night Cream every night. Who is this line for? Even Out is a line for women of all ages who want a naturally beautiful skin. The Even Out consumer wants a simple but effective routine that reduces the appearance of dark spots and helps to achieve a more uniform and perfect complexion. We are looking for scientifically advanced products with natural ingredients in its formula. A line of face care with a unique combination of natural Swedish ingredients, and active ingredients such as LumiLight Complex and Active Antioxidant. Tagged with: Even Out Optimals, LumiLight Complex, Melanin, Oriflame scientists, reduce the appearance of dark spots.